Have you ever browsed your chromosomes? Missing from the Queen's Speech? The LostCousins newsletter is usually published fortnightly. To access the previous newsletter (dated 11th June) click here, for an index to articles from 2009-10 click here, for a list of articles from 2011 click here and for a list of articles from 2012-13 click here. You've got just 5 days to take advantage of Ancestry.co.uk's amazing generosity: until midnight on Sunday a 4 month Premium subscription (which gives UNLIMITED access to ALL of Ancestry's UK and Ireland records) will cost you just £20. By my calculations that's less than 17p a day - not bad when you consider that it includes well over a BILLION records! In case you're not familiar with Ancestry, or haven't explored the site recently, I've set out in the next article some of the most important resources on the site - because even if you've already got a subscription to another site, there are bound to be millions of records that only Ancestry has (hardly surprising when you consider that they have the biggest collection in the world). Click here to take advantage of the offer (but please note the small print below). This offer is designed to attract NEW subscribers - so naturally existing subscribers will not qualify - but if you are a lapsed subscriber you might (by far the simplest way to find out is to click the link). Offer based on purchase of a monthly Premium membership at the special offer price of £5 per month for 4 months. Offer available until 22 June 2014 at 23:59 GMT. Offer not valid for members with current subscriptions. To ensure you get continuous access to Ancestry.co.uk your monthly Premium membership will be renewed automatically at the end of each month unless you cancel beforehand, and your chosen payment method debited at the standard rate applicable at that time for a monthly Premium membership. I probably won't have time to send out a reminder, so don't delay, otherwise you might miss out completely! Even if you're already an Ancestry subscriber you might find this a useful reminder of some of the key highlights amongst the wealth of collections. No one website has all the data you need to trace your British ancestors, but Ancestry has more digitized pages from English parish registers than all other genealogy sites combined! Other counties are represented by transcriptions rather than images, and the coverage varies enormously from county to county. Use the Card Catalogue to see how many records there are in a given dataset. Ancestry has all of the England & Wales censuses from 1841-1911 including images of the handwritten schedules; there are also indexed transcriptions of the Scotland censuses from 1841-1901. A particularly useful feature of the search is the ability to include multiple family members with specified relationships, since it allows searching on forenames only. You can search all or any of the UK censuses from this page. The main strength of the military records collection is in First World War records, where Ancestry has most of the surviving service and pension records. In addition, the WW1 Medal Roll index cards comprise the most complete collection of WW1 soldiers - approximately 90% of soldiers are included, which makes it a very useful resource. You can search all or any of the military datasets starting from here. Lists of incoming and outgoing passengers survive from 1890 to 1960 (there are also a small number incoming lists from 1878-1888, but most were destroyed in 1900). Only ships which travelled outside Europe and the Mediterranean are included in these Board of Trade records, but with nearly 40 million entries between the two collections they are a major source of information for family historians. Although the outgoing lists are the obvious place to look for evidence of emigration, sometimes people came back to visit their family "in the old country", and when this happens you can pick up all sorts of clues. For example, I only discovered that one of my cousins in Canada had married his brother's widow in 1925 when I saw the two of them travelling back to the UK for a visit in 1960. The National Probate Calendar is an amazingly useful source, listing just about every will and administration in England & Wales between 1858-1966. Now that it costs £10 to send off for a copy will it's imperative to make sure that your ancestor actually made a will, and that it went to probate (not all wills need to be proved). If your ancestor died before 1858 you might even find a copy of the will online - Ancestry have Prerogative Court of Canterbury (PCC) wills from 1384-1858 (and yes, I do mean 1384 - how's your Latin? ), Gloucestershire Wills & Inventories from 1541-1858, and Dorset Wills & Administrations from 1565-1858. I don't have time to tell you about everything but look out particularly for electoral registers, voters lists, school admission & discharge registers, Poor Law records, and the BT Phone Directories up to 1984 (great for following up on 20th century relatives). There are millions of family trees at Ancestry, with over 3 billion entries (inevitably there will be some duplication) and amongst these trees there are likely be dozens which have been posted by cousins of yours. But before exchanging information with people you find always verify their connection to your ancestors - many people who post public trees are less experienced than LostCousins members, and therefore more likely to make mistakes (a large tree is probably just as likely to be an indication of inexperience as of experience). Bear in mind that if you provide information to a cousin who has an online tree they're likely to add your data to their tree. I'm always careful only to pass on information that's directly relevant - I never share my entire tree with anyone. Many experienced researchers choose not to post their tree online, but you can still make use of your Ancestry subscription to find them - through LostCousins! To have a reasonable chance of linking to your cousins you need to enter their ancestors as well as your own, and whilst the 1881 England & Wales Census transcription is free, other censuses aren't - so you need a subscription to trace your collateral lines. Why is it necessary to enter your cousins' ancestors? Because if you only enter your ancestors and they only enter theirs, you'll only match if your common ancestor(s) were still alive in 1881 - and that obviously won't be the case for the vast majority of your 'lost cousins'. By definition someone who is a cousin is descended from a collateral line (otherwise known as a side line) - for example, your 1st cousins are descended from your parents' siblings, your 2nd cousins are descended from your grandparents' siblings, and so on. When you research those collateral lines and bring them forward in time you're opening up new paths to discovering 'lost cousins'. You can use Ancestry to track what happens to your ancestors' siblings, starting from 1841 (or even earlier if the parish records are online), and going all the way to 1881: you'll want to find their marriages, their children, even their grandchildren. All of their descendants are cousins of yours, and the cousins recorded on the 1881 Census might well lead you to some of the thousands of cousins who are alive today - your 'lost cousins'. When LostCousins member Frances decided to use DNA testing to find out whether or not a family story was true she didn't expect to solve a mystery that had featured in national newspapers back in 1968. In November of that year, almost exactly 9 months after Valentine's Day, a new-born baby girl was found abandoned - wrapped in a laundry bag and left by the dustbins outside a block of flats in Walthamstow. Rushed to Whipps Cross Hospital the little baby survived, and she was fortunate to be adopted by Les & Daphne Fuller, who had three children of their own - but it wasn't until she was 21 that she realised she was a foundling. Like so many adopted children she wanted to know more, and in 2011 the Daily Mirror once again took up the story - as Michelle, now 43 years old with two children of her own, pleaded for help in finding her natural parents (you can read the article here). Meanwhile Frances was longing to find out whether it was really true that she had an ancestor who had been a slave in the Caribbean - and after reading my DNA articles she decided to take a Family Finder test with Family Tree DNA. Last year Michelle also decided to find out whether a DNA test could help with the conundrum that not even national newspaper coverage could solve - and she too chose to test with Family Tree DNA. In January 2014 Michelle was delighted to discover that she had been matched with Frances - who immediately realised that as she had had two uncles who lived in Walthamstow, one of them could be Michelle's father. By this time one of the uncles had passed away but John, her other uncle, had been 38 and single at the time that Michelle was conceived - and though by now in his 80s he readily agreed to take a DNA test, which confirmed that he was Michelle's father. On Saturday the Daily Mirror broke the story - and I'm delighted that Frances immediately came to me, so that she could share her experience with other LostCousins members. A final thought: just as LostCousins can only connect cousins who have entered the same relatives on their My Ancestors page, Family Tree DNA can only connect cousins who have taken the same DNA test. Michelle and Frances had quite different reasons for testing their DNA, but thank goodness they did! Will you be able to help your cousins by testing your DNA? Note: last weekend Family Tree DNA passed the milestone of 1 million DNA tests! The Family Finder test that Michelle and Frances took is the 'lucky dip' of DNA tests - you simply can't predict what you'll discover. However, when you want to knock down a specific 'brick wall' it's better to use Y-DNA and mtDNA if you possibly can - because the way that these parts of the genome are inherited you can zero in on a specific ancestral line.. In the last newsletter I showed you how you might identify an ancestor in your direct paternal line using a Y-DNA test. Of course, if you're female you won't have inherited your father's Y-DNA - so you'd need to find a male who is prepared to help out. This might be your father (if he is still alive), your brother, your father's brother, or your father's brother's son - or any cousin who is descended in the direct male line from the ancestor you're trying to find out about. On the other side of your tree you'll find the direct maternal line - your mother's mother's mother and so on. Mitochondrial DNA (mtDNA) is passed from mother to child, so in theory you can investigate your ancestors in that line using mtDNA tests - but in practice it isn't that easy, because mtDNA mutates far more slowly than Y-DNA. Why is the slower mutation rate a problem? It means that even if you have an exact match, your common ancestor could be more than 500 years ago, ie before parish registers began. Even if your common ancestor lived more recently, tracing the maternal line is always more difficult - because the surname changes with every generation you have to find each female ancestor's marriage before you can start looking for their baptism. In any case, most of the time the 'brick walls' in our research aren't conveniently on the extreme edge of our tree - they're somewhere in the middle. 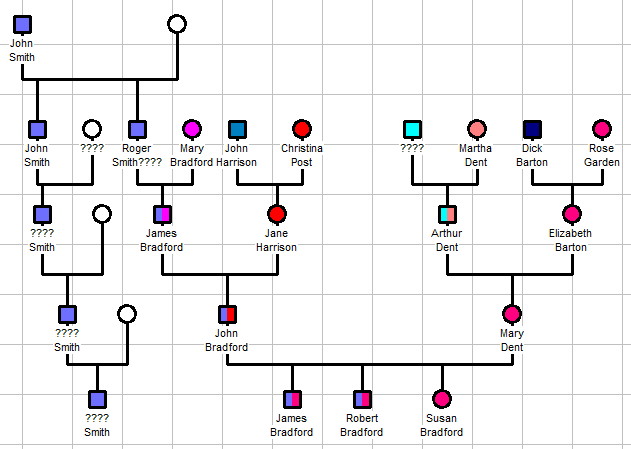 For example, in the diagram above Taken from the previous article) Arthur Dent was illegitimate, but can't passed his father's Y-DNA to his daughter Mary, because only sons inherit Y-DNA. However, it's quite possible Mary Dent had one or more brothers who would not only have inherited Arthur's Y-DNA but also passed it on to their own sons. Because surnames and Y-DNA are both passed from father to son, when you're trying to solve a paternity issue you generally need a male cousin with the same surname as the son whose father is unknown or in doubt. This is a rough and ready guide - when you've identified some possible candidates double-check that they will have inherited Y-DNA from the unknown father by tracing it on a family tree diagram. Sometimes you'll know that the right person exists, and how to get in touch with them; sometimes you'll know they exist, but not how to contact them; sometimes you won't even know that they exist. This is where LostCousins can help - by connecting you with cousins who'll either be able to provide an appropriate DNA sample themselves, or else can put you in touch with another family member who has inherited the DNA you need to test. Tip: remember that occasionally the person you'd like to provide a sample won't be a relative - or at least not according to written records. To find people like this use the 'DNA research' feature of LostCousins - it allows you to enter people who aren't relatives, but whose descendants' DNA might be able to solve a mystery in your family tree. If you take a Family Finder test at Family Tree DNA you're likely to be matched with hundreds of people, but not all of those matches will justify immediate investigation. For example, I'm currently matched with 349 people, but just 7 have a predicted range of 2nd to 4th cousin, whilst 27 are in the range 3rd to 5th cousin. If you're trying to find someone who is a 4th or 5th cousin there are a quite a lot of family lines to consider (32 and 64 respectively) and if either one of you has a 'brick wall' within the last 5 or 6 generations the connection between you may not be obvious. Indeed, there may be no connection at all - it's possible for two people to have common sections of DNA purely by chance (this is often referred to as 'Identical by State', although 'Identical by Chance' would be more realistic). Where it starts to become interesting is when there are three or more people who share the same stretch of DNA, because then it becomes much easier to figure out which is the relevant line. 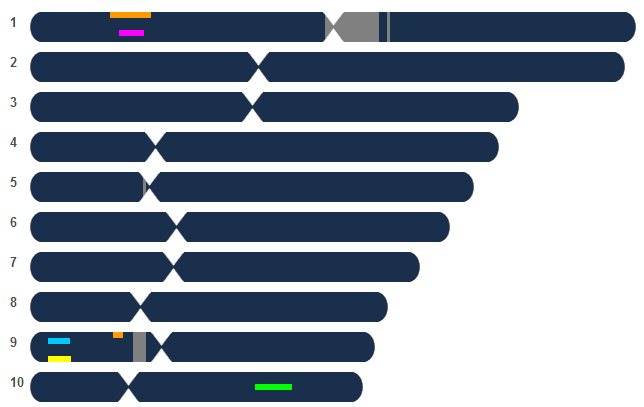 At Family Tree DNA you can use the Chromosome Browser to visually compare your matches with up to 5 others to see whether there is any commonality. As you can see, I've got a match with two potential cousins in the same area of chromosome 1, and a match with two others in chromosome 9. It could just be a coincidence, but it's something to bear in mind as I attempt to figure out whether and how I'm related to them. After the State Opening of Parliament 2 weeks ago, when the Queen delivered a speech outlining the government's legislative programme for the new session, a number of political commentators highlighted the relatively small number of bills that will be put before parliament. If they're right, surely this would be a great time to present a bill that would surely be supported by all the major political parties - one that dragged the moribund General Register Office out of the 19th century into the 21st? "Central government where possible must become a digital organisation. These days the best service organisations deliver online everything that can be delivered online. This cuts their costs dramatically and allows access to information and services at times and in ways convenient to the users rather than the providers." Instead, Andrew Dent - the Director of Civil Registration and Deputy Registrar General - recently suggested that the GRO would meet its obligation simply by putting the indexes of births, marriages, and deaths online! Sorry, Mr Dent, that simply won't do - those indexes have been online for years, thanks to FreeBMD and commercial sites such as Ancestry and findmypast. In fact, the GRO's main contribution so far has been to stop the sale of the indexes, which means that to find out about births, marriages, and deaths for the past 6 years you have to go to one of just 7 libraries around the country AND LOOK THEM UP ON MICROFICHE!!!!! Personally I don't think any legislation is necessary to make the historic registers available online - a dose of commonsense is all that's really needed - but if it takes a bill to wipe the complacent grin off the GRO's face then so be it. When I spoke to my MP, a former Deputy Speaker, he suggested that a one sentence bill would be sufficient to fix the problem! Whilst that might be a little optimistic it's worth bearing in mind that the Act which set up the civil registration system in 1836 wasn't much longer than the average LostCousins newsletter, so a paragraph or two should suffice to give a little tweak to the legislation - and a much bigger tweak to the noses of the GRO top-brass. In the 1980s we laughed at the antics of the civil servants in Yes, Minister and Yes, Prime Minister; in the 1970s we cried with laughter as Basil mismanaged Fawlty Towers; at the turn of the millennium we winced as we watched The Office. When you consider that the General Register Office is based in a former hotel, surely it’s got all the key ingredients for a classic comedy? Ever since I got my first VCR in 1978 I've been recording TV programmes of interest so that I can watch them when it suits me - and there was invariably a last minute scramble to find a blank tape. I could only afford three when I started because a 3-hour tape cost the equivalent of £70 in today's money, and the VCR was rented, because to buy it would have cost £695 at a time when the average worker took home around £200 a month. Of course, these days it's so easy to catch up on programmes we've missed using BBC iPlayer and ITV Player that recording them when they're own seems rather old hat - but I still do it, not least because I archive some of them to DVD or Blu Ray so that I can watch them if the day ever comes when I'm short of things to do! Anyway, one of the advantages of this brave new world is that I can tell you about programmes after they've been on, and after I've watched them myself - which makes me a lot happier recommending them. For example, this week I watched If I don't come home - letters from D-Day, which ITV broadcast on Thursday 5th June, the eve of the 70th anniversary. It focused on 4 of the soldiers and sailors who took part in the assault, and included not only their letters but also interviews with their children and other relatives. It was excellent - and I'd thoroughly recommend it to anyone who remembers World War 2 or has family members who were involved in the conflict, whether or not they were on the Normandy beaches. You'll find it on ITV Player here (my apologies if overseas readers are unable to access it). At one time I used to have time to go to local auctions where, perhaps inevitably, most of the lots came from the house clearances. Even though my interest in family history was yet to flourish I used to despair at the number of personal items, such as photograph albums, that had been consigned for sale with no indication of who the owner had been. At least they survived - and might perhaps one day find their way back to the family - but many things are thrown away or burnt, even though family historians (and social historians) of the future would find them fascinating. Thank goodness most people reading this newsletter are able to scan photographs and documents so that a digital copy survives, even if the original is lost. Of course, once you've got a good quality scan you can give copies to those relatives who are interested - if there are large numbers you might want to record them to CD ROM or DVD-R (I'm sure you'll be making a copy for yourself anyway - hard drives and memory sticks don't last forever). It's not only executors and administrators who commit bad deeds - some of the people we trust most are just as guilty. Did you know that some solicitors and mortgage lenders destroy the original deeds once a property has been registered - and that they do this without reference to the owner? Quite apart from the shame they should feel for ordering the destruction of historical documents belonging to somebody else, don't they realise that land registration isn't completely cut-and-dried - mistakes can be made, and it may only be possible to put matters right if the original deeds are available? I have written about this before, but it was many years ago, so I'm grateful to Joyce and Christina who both wrote to remind me. Last July I wrote about the way that my late father's file was marked "Not for resuscitation" when he arrived in hospital for the last time - and expressed my concern that neither he nor family members were consulted, or even told about this decision (I only discovered about it when I obtained my father's hospital records after his death). Subsequently I was told by a couple of LostCousins members who had worked in the NHS that it was quite normal - nothing to worry about. But I did worry about it, especially when I got further into the file and saw that a doctor had written "End of life" 3 days before my father died - and again nobody told the family. It was just hours before Dad died that a doctor finally told me what was going to happen. I wasn't alone in thinking this was wrong. Yesterday the Court of Appeal ruled that doctors have a legal duty to consult with and inform patients if they want to place a Do Not Resuscitate (DNR) order on medical notes - see this BBC News story for more details. First of all, a big thank you to everyone who has sent me their favourite fudge recipe - there's amazing diversity so I'm going to have to try out as many as I can. Surprise ingredients included vinegar and garlic (though not in the same recipe), and also marshmallow. Next month the Tour de France is coming to England - and at one point they planned to cycle past the end of my road. The bad news is that they subsequently decided to change the route; the good news is that before they did, Essex County Council committed to resurfacing the roads on the route, and repainting the white lines, so we haven't done too badly out of it. When I was young one of my favourite meals was pilchards on toast, and I recently discovered that sardines in tomato sauce make a lighter and very tasty substitute - and they're high in Omega 3, which could be a bonus (depending which research you believe). Talking of research, I read recently that paracetamol (acetaminophen) is not nearly as benign as had been thought when it comes to stomach bleeding - it could be just as harmful as ibuprofen (New Scientist 31st May). Sometimes I just don't know what to believe! One source of information that I do generally find reliable is Which? magazine, which I've subscribed to for many years (my mother also subscribed in the late 1950s and 60s - so she must have been one of the first). I find it particular helpful when I'm buying a domestic appliance, or a car, because when you're buying something that should last 5 or 10 years you want the best possible value for money - but I also find it useful when it comes to supermarket products because, contrary to general opinion, price isn't a particularly good guide to quality. And, because the Consumer's Association is a charity, I know that the money I pay them is going to a good cause. Finally, a reminder that just as you can't fight with one hand tied behind your back, it's difficult to research your family tree if you only have access to one of the two leading websites. Why? Because, once you get beyond the censuses, their record collections are so different. Just as I was finalising this newsletter I discovered that findmypast have taken over Origins.net - I'll tell you more about this in the next issue. And if you were experiencing any problems logging in at Ancestry.co.uk, or with the links to the Special Offer page, I'm glad to say that everything's now back to normal. Thanks for taking the time to read my newsletter - I hope you find it useful.